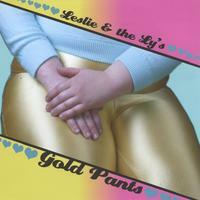 Gem Sweaters, golden Spandex and Lady Rap can only mean one thing, the sweet sounds of Leslie & the Ly's FIRST RELEASE entitled "GOLD PANTS. Bangin' beats, lay it down hommies. I wish I had a Gem Sweater and matchin' gold pants! this cd rocks big stylee! I love this CD. It's a bit short, but what it lacks in quantity it makes up for in quality. It is by far the most razzle-dazzle album I own. I can't wait for a follow-up and I hope it includes the song Beat Dazzler which is 100% pure gold. Everyone needs to just find their nitch and do what you do. You girls have done that. You get in where you fit in and you can't knock that. Keep doing you! Hotter than hot, we exploded. Intensely beat crazy and humorous to the max. A tiger pit of fun and dance-fun. All humans will wear gold pants in the future and be slick, smooth, and fashionably chic whether attending parties or watching TV. A CD for all who are not stuck-up and for those who are. Leslie Hall has permeated my shizzling soul. Note: I hold resist giving the final fith star as "Beat Dazzler" is not on this CD and should be. It was a cruel twist of fate to find it missing on the cd. "Hey beat dazzler, gem me a sweater! Hey hoochie mama, gold pants forever!" Leslie's talents pierce the veil that have previously denied chunky white girls in gold spandex access to the world of rap. she is more than just brave, she is a role model for the young and old, the geeky and chic-y, the girly and the manly alike. she is a fountain of glistening semi-precious gem-tastic genius. Leslie Hall is a new icon of feminine power bursting in a dazzling ray upon the horizon of the American conciousness. ....and...the only annoying thing really, is that some of the songs just sort of end. she commands the beginning and middle of her songs but then it's like the phone rings or the pizza guy shows up and she has to end the songs wherever. and did i mention "Beat Dazzler" isn't on the cd? Oh, the humanity! May thy jams forever rule...may thy gems forever sparkle !!!!! This CD rocks !!!! It's brave. It's catchy. It's certainly ars gratia artis !!!! Can't wait for the next one! I laughed, I cried, I tinkled in my pants a little bit.. This cd has changed my life. Since I got this cd the world is a happier place. The sun shines brighter, birds chirp louder and the air is fresher. The CD was an exceptional contribution to the American culture, a significant breakthrough if you will. Gold Pants and Gem Sweaters may just reenter the mainstream. The jams are perfect and the rhymes are outstanding. Leslie, if you read this, you must come back to Burlington and bless this town with more jams. I am now a true devoted apostle of your sweet melodic hip-hop gospel!